As a kid growing up on Cape Cod, I never thought that I would eventually own a horse business in Albuquerque, New Mexico. But I knew from a very young age that horses were the most amazing animal on this planet. I pushed my parents for years to buy me a horse, but I had no idea what to do with a horse or how to take care of it. 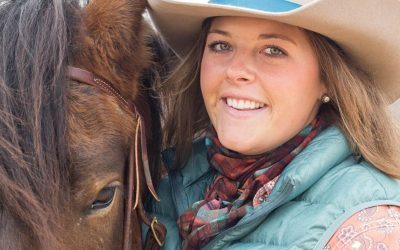 I joined a 4-H club to learn all that I could about horses. Then I made the decision to find a college that offered a degree in horses. I found Johnson and Wales University in Providence, RI, where they offered a Bachelor of Science in Equine Studies and Riding. For the last trimester of my degree, I went out on a work co-op to study horse breeding and training in Lemitar, NM. When I stepped off the Amtrak in downtown Albuquerque, I knew I had found my forever home. Fast forward to 2008, after almost 20 years in retail management, I decided it was time for me to get back to the horse world full time. I read every book I could find about starting a business and I signed up for every free business class I could find! When my parents moved to Albuquerque in 2012, they bought a property with horse facilities. That sealed the deal; I was starting Enchanted Equine Adventures, LLC. 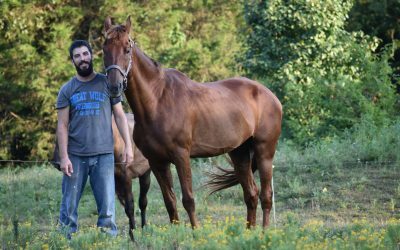 Finding horses for a lesson program and therapeutic riding business is not an easy task. I was determined to start with rescue horses, as crazy as that sounds. Luckily, the best horse rescue in New Mexico is not too far from me. The New Mexico Horse Rescue at Walkin n Circles Ranch (WNCR) was the perfect place for me to spend my time! I went through their volunteer training program and started working with a few of the stand outs in my mind. I was able to groom them and work with them to see if therapeutic riding was going to be an option for them. I worked with one stout Quarter Horse/Draft cross named Misty. She had two brands and lots of scarring on her body; I knew she had a hard life before coming to WNCR. She was a great height and build for carrying large adults. I worked with her for a few months to check her temperament. They told me that she was herd bound. It only took a few sessions for her to relax while I groomed her and walked her. When I first attempted to ride her in the round pen, a volunteer had warned me that the sand was soft and the mounting block might move. Of course, it did and I fell off! Misty stayed where she was looking down at me, like “why are you down there?” That gave me a good look into her disposition. She had a difficult time with people in the past, but she trusted me already. Meanwhile, in another paddock, I went off to get a horse that was recommended to me by the head of the adoption team. While trying to catch said horse, a different beautiful bay mare followed my every move. She had the softest eye and sweetest demeanor. But she was a Thoroughbred and I’d seen her race around in the ever-blowing Edgewood wind. She was not a contender on my list. I’d never heard of anyone utilizing former race horses as therapeutic riding horses, on the ground therapy work, yes, but not for riding. She was persistent though, she’d follow me, with her eyes, no matter where I was on the ranch. Eventually I had to inquire about her. She’d been at the rescue for over a year and no one had worked with her. No hope was in her future so far. Her name was Cinnabar and I like to think that she adopted me. She told me in no uncertain terms that she was meant to come home with me. I rode her and took her for a trail ride with some of the ranch staff. She was amazing! But she needed some muscle and some consistent work. Neither Misty, nor Cinnabar was perfect. But they were perfect for me! I adopted the two mares on May 7, 2013. The two horses had not met previous to being turned out together at my place. But when they arrived and ran around together, it was as if they had been a herd forever. No fights, no squeals, no injuries. Cinnabar was the leader and Misty happily fell into place beside her. In June of that year, I noticed Misty’s flank was looking a bit odd. A huge vein down her side started to stick out much more than normal. Having worked in the breeding industry for many years, I knew what a pregnant mare looked like. I called the rescue and asked if it was possible that Misty was pregnant. They assured me that she’d been there long enough for them to know if she had been pregnant. Well, at the end of June, Misty coliced and I had to have the vet out. I warned the vet that she might be pregnant. He confirmed that she was indeed pregnant and very far along! One month later, we had a perfect black colt named Acheron. From Misty’s brands, we determined that she was formerly a PMU mare, so Misty had probably had quite a few foals before. But this one she got to keep and raise herself, with Cinnabar’s help and approval of course! Acheron was the cutest little thing. He was born jet black, so dark that he was purple in the sun! He had black on black tiger stripes on his back legs. We assumed Dad was a mustang. Now we know that he is Quarter Horse and Andalusian mostly. He was always such a rascal, getting into everything. Sadly, Misty’s joints were not happy with the New Mexico sand and her severe aversion to veterinary care gave us little choice in the end. She was a great Mom and did fantastic with my first clients, but we had to say good bye to her before her pain got too bad. I have lots of fun videos of her running with Cinnabar, Acheron and our next addition, Rocky. 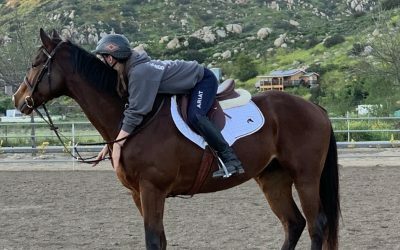 Cinnabar has become an excellent therapeutic riding horse. She has the perfect temperament for the work. She loves children. She enjoys walking and not working too hard, so this is the life for her! Because of her previous life, she now requires regular chiropractic adjustments and lots of long and low exercises. But she is that one horse who moves your soul, to me, anyway. She and Acheron have a forever home here with us. I will be forever thankful to WNCR for helping me start my business and giving me the opportunity to give these abandoned horses a loving home. I strive to give back to them and promote them as much as I can. I am hopeful in the future we will be able to work together to find appropriate WNCR horses a home in therapeutic riding centers all around New Mexico. This means finding the horse that moves your heart. She may not be the prettiest or do all the things you wanted to do, but she is still part of your heart. She will have a forever home with you. Never to be abandoned again.